180 Nutrition has introduced a new protein powder to the market that harnesses the power of organic hemp. 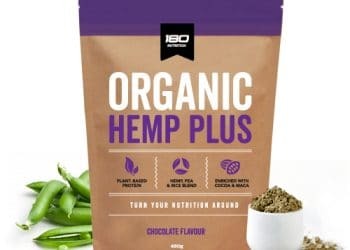 The Australian supplement brand’s Organic Hemp Plus powder combines hemp protein sourced from Tasmania with sprouted brown rice protein, sprouted and fermented pea protein, maca powder, cacao, and stevia – all of which are organic. It can be used much like any other protein powder as a shake, blended into smoothies, or baked into recipes. The addition of organic hemp means the powder contains all nine essential amino acids and provides the perfect balance of omega 3, 6 and 9. 180 Nutrition Organic Hemp Plus is organic, vegan, and free of gluten, dairy and soy.